Anyone dreading Inauguration Day will appreciate The Trump Survival Guide. Stone lays out the key fights ahead - over women’s rights, LGBTQ+ rights, the environment, health care, and more - and offers actionable solutions to counteract your feelings of powerlessness. This book will help you make a bigger impact. A comprehensive resource guide for individuals worried that certain rights may be in jeopardy, offering the encouragement to actively fight back with as much knowledge and authority as possible. The resulting book is crisp and pragmatic. Though the book includes specific ways to attack every issue—joining your local school board to help with education, reporting hate crimes when you see them to help with civil rights—there are broader, universally applicable ways to fight Trump’s agenda. 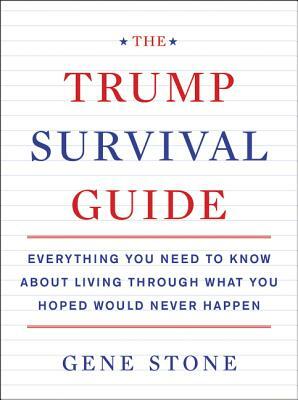 The Trump Survival Guide is worth every dime of its price. It is chock full of reference material and addresses not easily found, including website addresses that only a Googlemeister could turn up. Everything novice activists need to get started, all in one place. The ‘What you can do’ sections, are varied and each worthy of careful perusal. Americans concerned about their country’s fate under a Donald Trump presidency will find that this book is the ideal resource for meaningful civic engagement.